Are you at the early stages of planning your outside kitchen? One of the questions you’ll need to ask yourself as you plan is which appliances you’ll want to include. Your outside kitchen should reflect your needs, so be sure to choose the appliances that fit your lifestyle and your cooking habits best. You’ll also need to make sure you choose appliances that can withstand the rigors of the outdoors. 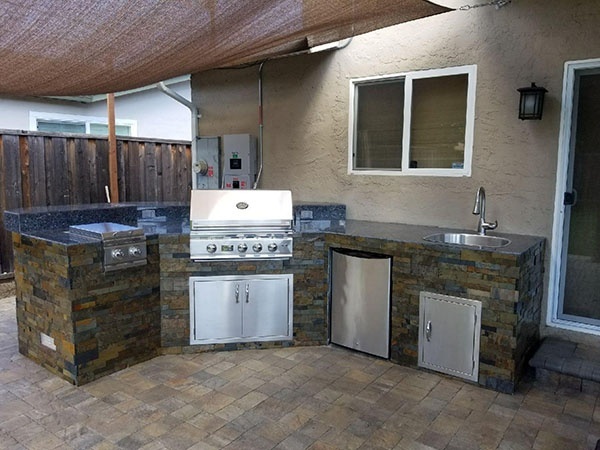 Your outdoor kitchen is an investment, and you don’t want issues with rust or mold to shortchange you! Your grill is the heart of your outside kitchen, and arguably the only appliance you truly need to include. Whether you prefer gas or charcoal, you’ll want to choose a high-quality grill that will make cooking a joy. See our full post on how to choose the right grill for your needs. To extend the life of your grill, you’ll want to make sure you cover it during the winter months or whenever it’s not in use. Besides a traditional grill, you may want to invest in a tool for another cooking method, such as a barbecue smoker, a pizza oven, or a ceramic kamado grill. Since these require similar care and upkeep as a regular grill, you’ll want to make sure you only include them if you know you’ll get a lot of use out of them. Planning to throw large parties with lots of food items being prepared simultaneously? Consider adding a side burner or a warming drawer to make sure everything’s still hot by the time you serve it. Having an on-site sink can make cooking a whole lot easier: it gives you easy access to fresh water and allows you to wash veggies, cookware and other items right on the spot, without having to traipse back and forth from your indoor kitchen. To prevent issues with rust, mold, and bacteria, consider a sink basin made with 304-grade stainless steel. This particular steel alloy is easy to keep sanitary and avoids corrosion, even in outdoor settings. For faucets, we recommend stainless steel or brass with a PVD (physical vapor deposition) finish. Also, when planning for a sink, be sure to take these outdoor plumbing options into consideration! A small refrigerator in your outside kitchen provides a great deal of convenience, whether you want a handy place to keep marinating meat before you cook it, or you just want to have cold drinks within easy access for your guests. It’s not strictly required, of course—you can always use your indoor fridge for storage—but it sure is handy to have! Whatever you do, you’ll want to make sure you get an outdoor refrigerator. Even if you have a closed-roof pergola protecting your kitchen from the rain, it will still be exposed to varying temperatures and moisture that an indoor refrigerator probably won’t be able to tolerate. 304-grade stainless steel is always a good choice for a weather-resistant finish. One more thing to keep in mind: in order to have a fridge, you’ll need to think through how you’re going to get electric power to your kitchen. Not sure where to go from here? Our professional kitchen designers would be happy to help you find the right appliances for your needs. Our crews build sturdy kitchens with weather-resistant materials, and we’ll be happy to help you choose the appliances that will last for years to come.